Today's photo of the day comes from A.I. Artificial Intelligence. 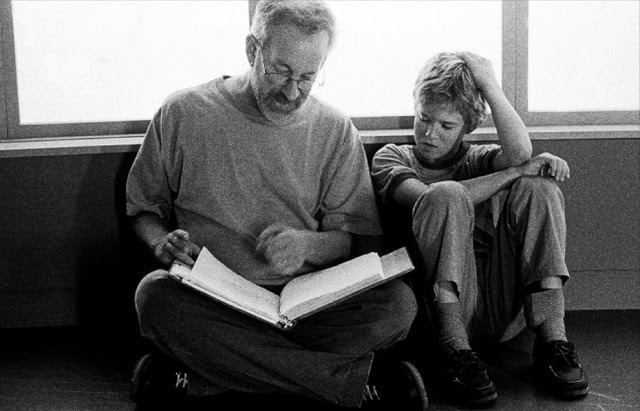 Steven Spielberg and Haley Joel Osment check the script intently. Did you know that for the last seven minutes of A.I. the composer John Williams wrote a piano concerto, and it went over the length of the film. Steven Spielberg stopped the projector and told Williams to just let the music continue. Spielberg along with his editor Michael Kahn then re-edited the last seven minutes of movie into Williams' piano concerto. Spielberg did a similar thing years before E.T. the Extra-Terrestrial (1982), where he and Carol Littleton edited the last 15 minutes into Williams' music.